EDIT: Giveaway is officially over. Congratulations to Amanda Smith for submitting the randomly-chosen 672nd entry. Life is the Bubbles will email you soon with how to claim your prize. Now that I've seen snow, I'm ready for winter to be over. I might just have to hibernate until spring! Good thing I have a huge jar of honey from when I visited Smoky Mountain Farms in Tennessee. But it won't last as long as the hunny sealed into Life is the Bubbles' magical bottle necklace so let's hope warm weather arrives soon. 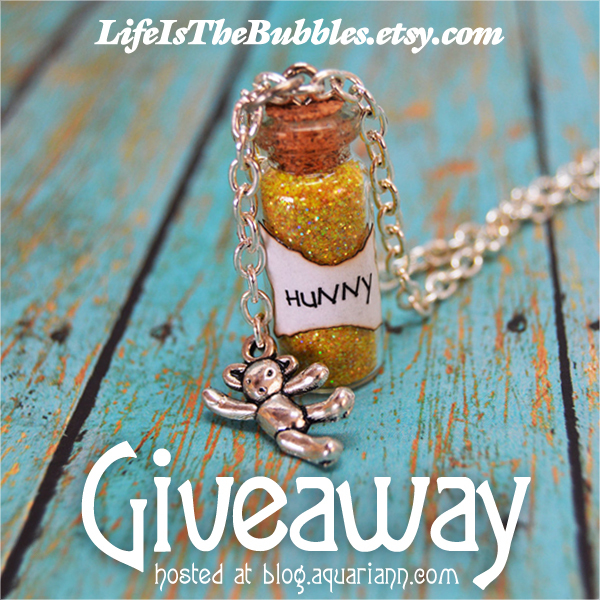 Brandy and Kathy are giving away a $35 gift card, which is enough to buy the adorable Winnie the Pooh necklace above AND another gift for a friend. Their handmade shop is overflowing with Disney-inspired jewelry that will fill you with childlike joy. As Pooh says, "Sometimes the smallest things take the most room in your heart." Use the Rafflecopter below to enter to win worldwide giveaway before 11:59pm EST on February 20, 2016. Be sure to leave the mandatory comment on the blog post with the same name you use to fill out the Rafflecopter - all entries by winner must be easily verified or a new winner will be chosen. Not including usernames when asked will also disqualify you. I like the retro Fresh Coffee sign! It would be hard to choose but perhaps the Adventureland charm necklace or the Just Keep Swimming. Alic ein Wonderland Tweedle Dee and Dum earrings!! The CINDERELLA NECKLACE, BOTTLE OF HAPPILY EVER AFTER PRINCESS MAGIC WITH A PUMPKIN CARRIAGE CHARM is my favorite! I love the Just Keep Swimming Magical necklace and also the “Who R You?” Alice in Wonderland Necklace with a hookah charm. The Alice in Wonderland Who Are You necklace is pretty! Great colour. Love the Alice in Wonderland Tweedledee and Tweedledum Earrings! My favorite is the ARABIAN NIGHTS NECKLACE WITH A LAMP CHARM, ALADDIN, MYSTICAL POWER, GENIE OF THE LAMP. I love URSULA POOR UNFORTUNATE SOULS NECKLACE WITH A LOCK CHARM, BRONZE, DISNEY VILLAIN, LITTLE MERMAID! I loved little mermaid growing up so I would love this necklace! i love the live your dream fairy tale bangle. There is some serious cuteness on this shop's website. It's hard to narrow down, but I think I would go with the necklace: ALICE IN WONDERLAND, THE CATERPILLAR, WHO R YOU, WHO ARE YOU? My favorite item is the FAIRY GODMOTHER MAGICAL PURSE CHARMS. The DISNEYLAND, DISNEY WORLD CHARM BRACELET, 15 CHARMS, FILLED WITH MAGICAL PARK REMINDERS is my favorite! My favorite is the Faith Trust and Magical Pixie Dust Necklace! It's between the just keep swimming and the ohana. Oh my goodness they're adorable! I like that Agents of S.H.I.E.L.D. charm bracelet! My favorite listing is the Tangled (Rapunzel) "I see the Light" necklace with sun charm. I love Tangled! ALICE IN WONDERLAND 6 WHIMSICAL GLASS STEMWARE CHARMS are cute! I like the Adventureland charm necklace. DISNEYLAND, DISNEY WORLD CHARM BRACELET, 15 CHARMS, FILLED WITH MAGICAL PARK REMINDERS is just dashing darling! Hakuna Matata necklace, for sure! I love the magic wands in a bottle! I like the Cinderella Necklace, Bottle of Happily Ever After Princess Magic with a Pumpkin Carriage Charm. I really like the MERMAID TEARS MAGICAL NECKLACE WITH A SEA SHELL CHARM. So stunning! THE FINDING NEMO ONE IS SO SO CUTE! I love the Alice in Wonderland, The Caterpillar, Who R You, Who Are You? BENJAMIN FRANKLIN QUOTE – BEER IS PROOF GOD LOVES US, ART PRINTABLE, PRINT WALL ART DECOR POSTER, MAN CAVE, INSTANT DOWNLOAD would make a great gift. I'd love the mermaid tears necklace! It's perfect. It reminds me of my favorite game. I love the Lilo and Stitch OHANA Family Magic Necklace with a Flower Charm by Life is the Bubbles. Lilo and Stitch are the perfect characters for any young child to look up to. Pretty pretty. i really like the Alice in Wonderland 6 Whimsical Glass Stemware Charms. it is really nice. I like the Drink Me Alice in Wonderland Bottle Necklace with a Key Charm, very cute. All the Alice in Wonderland pieces are beautiful! i like the World Charm Bracelet! I love so many of these but my absolute favorite would have to be Mermaid Tears! I really like the FANTASYLAND CHARM NECKLACE WITH A CASTLE AND CAROUSEL HORSE CHARMS ONE OF THE DISNEYLAND ORIGINAL LANDS and the NEW ORLEANS SQUARE, THE PRINCESS AND THE FROG, MARDI GRAS MASK AND SAXOPHONE SILVER PLATED CHARMS NECKLACE - DISNEYLAND. Love the items! My favorite is the Poor Unfortunate Souls necklace with the cauldron charm. Because The Little Mermaid is my favorite Disney movie. The MAGICAL BRAVE NECKLACE WITH A BOW CHARM is my favorite. I really like the Bare Necessities Magical Necklace with a Palm Leaf Charm the jungle book! one of my favorite movies. I really love the Let it go magical flakes and snowflake necklace. URSULA POOR UNFORTUNATE SOULS NECKLACE WITH A LOCK CHARM, BRONZE, DISNEY VILLAIN, LITTLE MERMAID is my favorite. I love Ursula! I like the Pirates of the Caribbean Charm Bracelet, Pirate Jewelry. I love the Faith Trust and Magical Pixie Dust Necklace! Captain Hook necklace with hook charm.